A second pilot whale has been found dead in a Hebridean loch after experts feared more than 60 of the animals had been at risk of becoming beached. The pod had left the shallow waters of Loch Carnan in South Uist on Saturday, but returned later that night. They have now headed out of the area - but an animal welfare charity confirmed another whale's body had been found. Tests on a body found earlier suggested the female died from disease, not because it was stranded on rocks. Marine experts said the rest of the pod had now left the loch and appeared to be heading south. Dave Jarvis, from the British Divers Marine Life Rescue (BDMLR) team, said it was thought the second whale had died elsewhere and floated into the area on the tide. Mr Jarvis said: "During the late afternoon, BDMLR operations manager Stephen Marsh was alerted to a possible sighting of a second dead whale in the sea loch. "A search was mounted and sadly the sighting was confirmed. "It was too dangerous to recover the body of the adult, although another attempt might be made tomorrow [Monday] although it was noted that there seemed to be little damage to the parts that were visible. "Due to its location and orientation, it is thought that the creature probably died elsewhere in the area and floated in on the incoming tide. "It is currently impossible to comment on why this animal died." BDMLR said the post-mortem examination of the first dead whale found "potential evidence of an infection" in the animal's melon, a fatty organ found in the forehead. It also showed external injuries to the whale were not enough to cause its death. Tests showed the female whale was just coming to an end of a lactation and rescuers said they hoped her young calf would have been fully weaned. The whales were first spotted around Loch Carnan, in the Western Isles, on Thursday, sparking fears they would die in a mass stranding. Some of the animals had injuries to their heads and a substantial operation to save them was launched. Mr Jarvis said the operation was now being wound down after it appeared the whales had left the area but those involved would continue to keep a watch for any sign of the whales. Rescuers said wounds spotted on some of the other whales would heal naturally over time. Environment Minister Stewart Stevenson said: "I am pleased to hear that the pod has left the loch and hope they remain in deeper waters. "The loss of life is very unfortunate but a number of teams working together in South Uist have ensured that a greater tragedy has been averted." 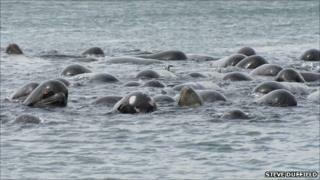 At the end of October last year, some pilot whales almost got stranded in the same sea loch. Less than a week later, 33 whales, believed to be the same group, were found dead on a beach in Co Donegal. Pilot whales prefer deep water but come inshore to feed on squid, their main food.